Summary: Paneb is the head of a family of embalmers; his young son Ipy is being trained to follow in his footsteps. When Yuya, father of Queen Tiye, dies, Paneb and Ipy oversee a lengthy process of embalming and burial. Each step is important in preserving the body for the afterlife, and there are many rituals that go with each part of the process. 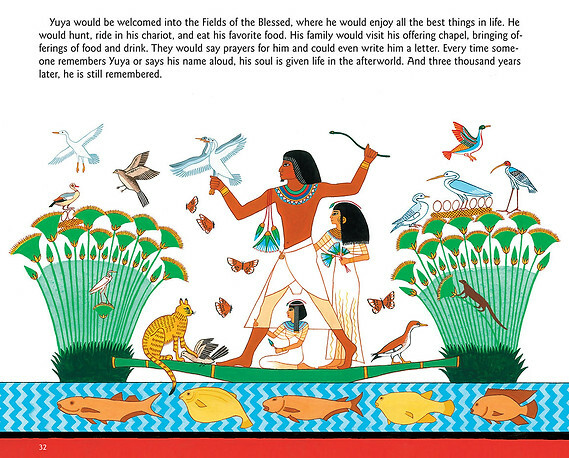 The Egyptian religion is described, with beliefs about what happened to people after they died. 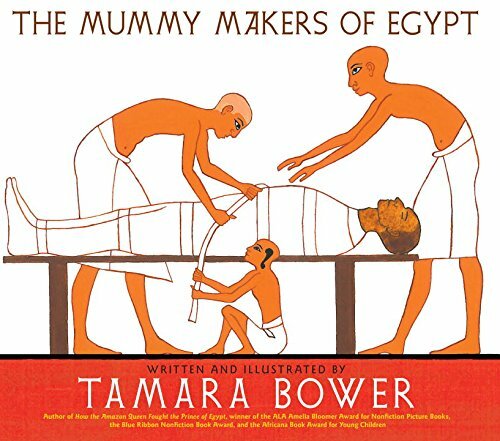 There’s also a section on the embalming process, with pictures of the tools and the people performing their jobs drawn in ancient Egyptian style. A lengthy endnote describes the discovery of Yuya’s tomb in the early 20th century; there are also a few photos and drawings of items found in the tomb. 40 pages; grades 3-8. Pros: Written and illustrated by an expert on ancient Egypt, this book is clearly a labor of love designed to impart a great deal of information about many aspects of Egyptian culture, both through the text and the illustrations. The end note, three pages of small type, is a bit daunting, but very interesting and informative. Cons: The section on the embalming process (e.g., brain removal through the nose) may not be everyone’s cup of tea.